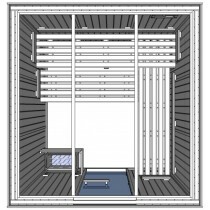 Using our vast knowledge of the commercial sauna industry, our design team have developed a range of light duty commercial sauna cabins that meet the criteria we consider to be vital to our clients and in turn your customers. 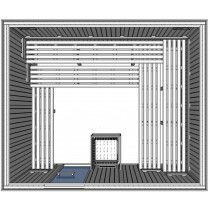 For full details of our light duty saunas please select any product from our range below or call our sales team who will be happy to assist you. 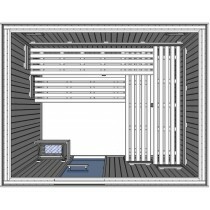 Light duty saunas are recommended for use in small salons or venues where the sauna will be used for up to around 20 hours per week, they feature reinforced benches, a heavy duty base which lifts the walls panels off the floor offering additional height and providing protection to the wall panels by lifting them away from any water laying on the ground. 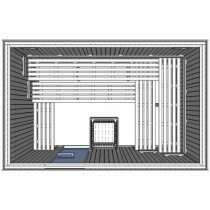 Each panel is constructed using the hidden nail technique to create a seamless finish and is double insulated to improve efficiency and reduce heat loss. 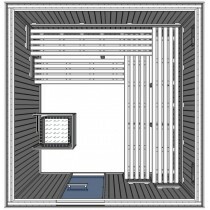 A modern full height safety glass door with polished chrome & Ash wood handle and polished chrome hinges, optional upgrade to our larger 940mm disabled access door.